Good Morning! It is about 06:00 this morning, and I am just about to leave for work. I am coming home today! I hope that all is well with you and that you are all ready for the holiday's because I'm not. I have to get going,but I should get in around 11:00pm tonight. See you soon. How's everyone doing? I am getting pretty aquainted to the new area. I have a much greater appreciation for sleep though, because I'm not getting any. I enjoy the department even though I have not recieved a check yet (they withhold the first check... hurry Jan 5 : ) ). School is designed to be a boot camp and is extremely strict, but I like it so far. I graduate from recruit school on April 27 and yes, I'm keeping track. I received the entire day on Friday and Monday off, so I get to come home earlier than expected for Christmas. Yea! Anyway Ihave to finish shining my shoes, for tomorrow. I will try to write later. 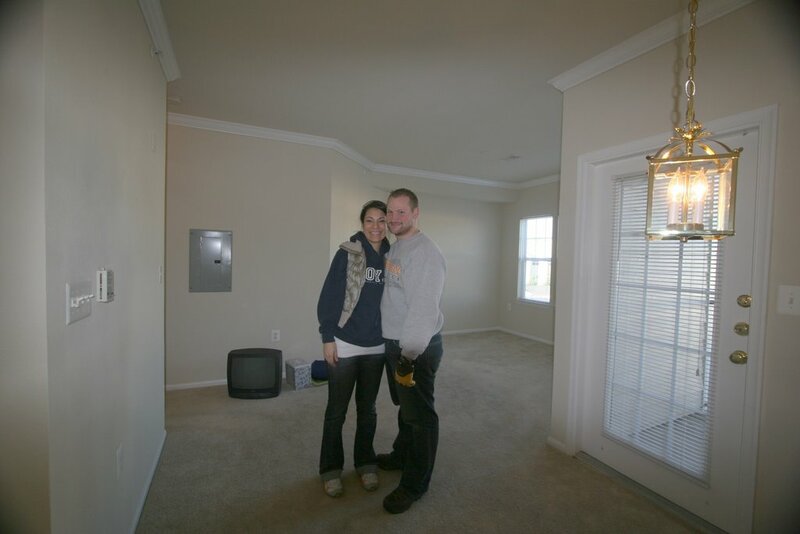 Here's Ben and I in our very first apartment!!! The area behind us is the living room and the area in the foreground is the dining room. Although the apartment is small (only 600 some square feet), the area is wonderful and the apartement seems bigger. We have a full washer and full dryer in the unit, newer kitchen appliances and two small balconies. I am going to do my best to keep up with this blog. I thought it might be nice to have a blog that both Ben and I post on especially since he is way far away in Virginia. Hopefully we can continue this blog from now until the wedding and long after that....but only time will tell if this blog will stay updated.